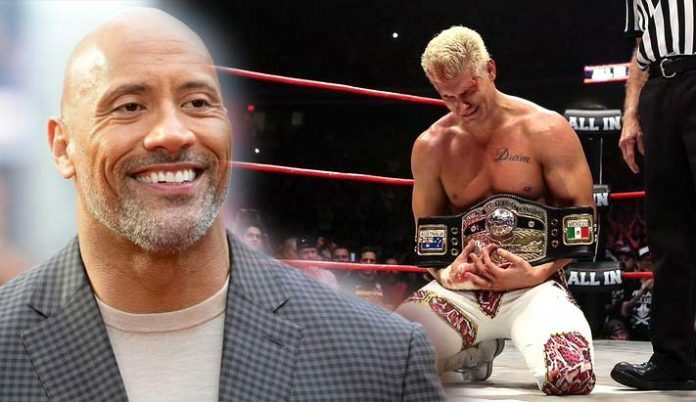 Hollywood megastar Dwayne “The Rock” Johnson has congratulated Cody on winning the NWA World Heavyweight Championship. Of course, Cody’s big victory came at Saturday night’s big All In pay-per-view from Chicago. Rhodes defeated Nick Aldis in a thrilling contest that delivered one of the most memorable moments of an emotionally charged weekend. Congrats my friend. So f’n cool! Cody thanked The Rock for paving the road for him and his peers. Cody and The Rock have more in common than meets the eye. In addition to having fathers who were wrestling superstars, both men have ventured into acting and both have expressed an interest in political careers. Check out this video of The Rock and Cody Rhodes having a fun interaction on WWE SmackDown back in January 2013. The Rock gets payback on Team Rhodes Scholars for interrupting The Great One’s homecoming.